J.D. 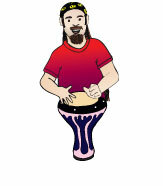 has been drumming since the tender age of 10, around the same time his parents told him he was from Jupiter. His drumming drove his older brothers crazy and provoked several late-night phone cease and desist phone calls from neighbors, but the Jupitarians always appreciated it. He later went on to graduate with a Bachelor of Music degree in Jazz Performance from McGill University where he encountered many other “people” from his homeland and began recording and touring the galaxy with his space-jazz ensembles (they had a #1 hit on Xyloglurben-3!). 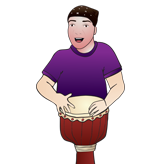 After graduation he worked as a house drummer on cruise ships and as a session drummer in various recording studios in Toronto until he met Mystic Drumz. He recently relocated to Cancun, Mexico where he does exclusive shows for talking jaguars and sea turtles and performs regularly in many of the finest hotels and resorts in the region for vacationers from all over earth. Mick got his first set of drums at age 12 and has been banging away ever since. He also plays piano, bass, guitar and sings, but drums are his first love. Mick studied at The American Conservatory and received his degree from The University of Illinois. Mick’s career has taken him across North America,Europe and Japan. The only he thing loves as much as playing music is teaching kids how to play. 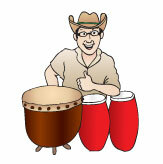 He believes that everybody who walks , breathes and has a heart beat is keeping time, so everyone is a drummer! The performer you know as Martin Coffey comes from Electric Latté Land and grew up playing Rock and Roll for the natives. When he got older he went to Drexel University to learn how to play and record music, so people in the future can hear what we do today! During the day Martin teaches drumming to kids and grown-ups everywhere! At night, he transforms into the super-hero known as Styx Latté, and plays drums with Rock and Roll bands! He gets to stay up really late and make lots of noise while people dance all night long!